In the 1990s, we gradually removed all our Pinot Noir vines from the valley floor and decided to plant a little part of the Heimbourg vineyard with this grape. We were looking for a later ripening area, capable to keep good acidity but also allowing us to harvest this capricious grape later, without risk of early rot development. The Heimbourg vineyard was ideal: deep marl limestone soil preserving character and acidity, later ripening and with frequent winds keeping the grapes healthy. The vineyard was planted high density (9000 vines/ha) and is pruned very low. The grapes ferment whole cluster and are gently punch down manually. The wine is raised for 18 months in small barrels that are between 2 and 6 years old. 2/2013: rich deep dark red colour with a light haze (no fining, no filtration). 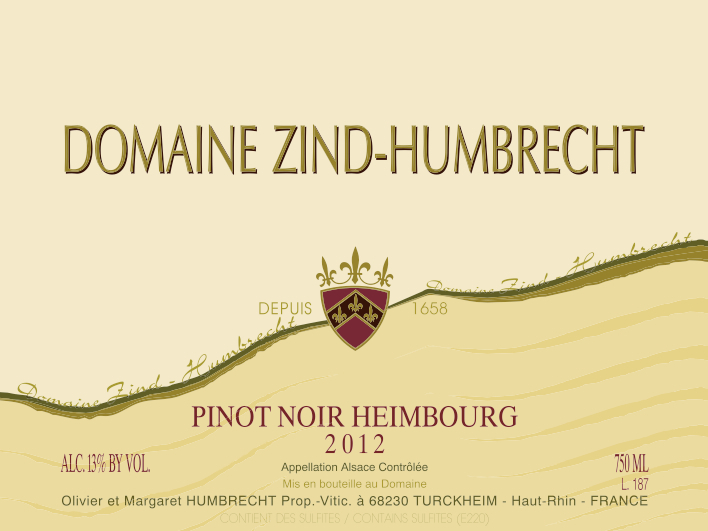 Amazingly intense for this later ripening vintage, showing great phenolic ripeness. The nose is very expressive with intense red fruits, cherries. The palate is smooth on the attack but as the wine stays in the mouth, some ripe tannin becomes more palatable. This is a very enjoyable Pinot Noir that will benefit of some time spent in the bottle.